You might, at first glance, take Lalibela for a Mexican cantina based on the exterior decor. Upon entering, pool tables and a large bar suggest little more than neighborhood watering hole. 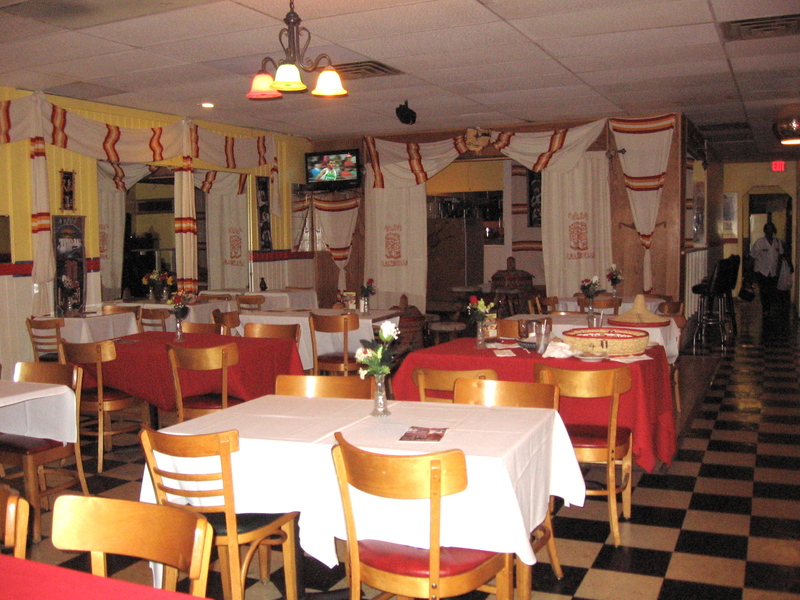 Look (waaay) back to the right, though, and you’ll see a fairly large and ornately decorated dining area. Beyond that lies a performance stage. If the above, and the flyers at the entrance promoting DJs and musicians performing there, are any indication, Lalibela is something of a small entertainment hub geared towards our city’s Ethiopian population. During lunch, though, it’s all about the food. We settled on hot spicy lamb (lamb sauteed in jalapenos and spices) and quanta firfir (beef ‘jerky’ mixed with strips of injera in a sauce). Every time we’ve had Ethiopian food, the presentation has never failed to impress. Lalibela is no exception. Both of our orders were served on a single large (probably close to 2′ in diameter) plate set within a covered woven basket. 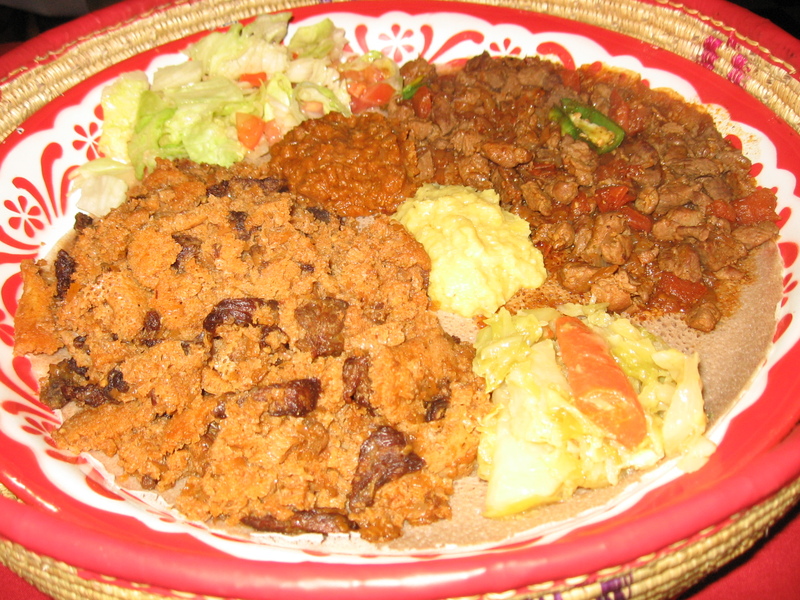 The cover is removed (with a flourish) at the table by the server, and basket of injera strips is provided on the side. A little bit about injera -it’s unusual stuff, and is an essential part of Ethiopian cuisine. It’s very thin, curious in its spongy texture and appearance, and is made from a flour/water mix that has been left to ferment so it has a sourdough-like tang to it. Injera is used as a ‘plate liner’ for most dishes (to sop up sauces from saucy foods above), in lieu of utensils (use strips of it to pinch food from the plate and bring it to the mouth), and is even occasionally mixed in with the dishes themselves (as with the quanta firfir). The hot spicy lamb was pleasant enough – the lamb cubes were tasty (though perhaps a bit overdone), and the peppers, sauce, and onions rounded it out nicely. Don’t take the name too seriously, though. Our server went to great lengths to verify that we were OK with hot spicy food when we ordered this, but only the most meager hint of heat made it into the dish. The quanta firfir was difficult to parse. It seemed to have two different components from two different worlds. The beef ‘jerky’, while conspicuously cured and dried, wasn’t especially tough (our server told us they cure and dry it in-house). The flavor was spectacular – beefy, ‘woodsy’, nutty, and mushroom-like were just a few of the words used to describe it. The injera and sauce, though, were puzzling as they seemed to almost cancel each other out, flavor-wise. Another oddity was the tanginess of the injera provided on the side – it was far beyond that of any other injera we’ve tried. Since you get some of it with each bite, this is more important than it might seem. Perhaps we just got a bad batch? Lalibela gets good buzz from the people we’ve talked with, and in spite of a few of the hiccups we encountered it’s easy to see why that might be. At under $10/dish, it’s worth checking out if you’re in the area. Vegetarians should be happy at Lalibela as there’s a significant meat-free offering. This entry was posted in African, Ethiopian. Bookmark the permalink. About the tangy flavor to the injera…the grain from which injera is made (teff, an iron-rich flour made from a plant that looks like grass) is often described as having a sour or tangy flavor. I’m not actually aware whether the injera bread in the U.S. is made purely from teff, or if some places would incorporate different grain flours. But I would attribute the tangy flavor of the injera to the natural acidity of the teff flour. Either way, I’ll have to swing by and sample the vegetarian wares! What are the general hours? How late do they serve dinner? Looking forward to trying this one in the next week or so! Andrew, I was by there late one Saturday -11:00 0r so – and they were open and had a sizable crowd. PM me here or on CU and maybe we can meetup. Jason I would be up for another trip here. Tonight was date night and this made for an excellent choice. We settled on 3 dishes to try and share between the two of us: the greens, lamb dices and hot and spicy chicken. This was my first time eating Ethiopian cuisine and it didn’t disappoint. We were happy with everything. Greens were very tasty, chicken was fall off the bone tender and wonderfully spiced as was the lamb. After finishing dinner, we had the leftovers boxed and went up front to play a couple rounds of 9-ball. Made for a great evening. I’m glad you guys explained the deal w/ inerja. For a very brief second I entertained the thought of asking for silverware and plates before remembering how everything worked. I can’t remember how much you guys go into detail about customs and how to eat at the various places but maybe it would be good to have a quick primer like the Taco Truck site on the various cuisine styles. 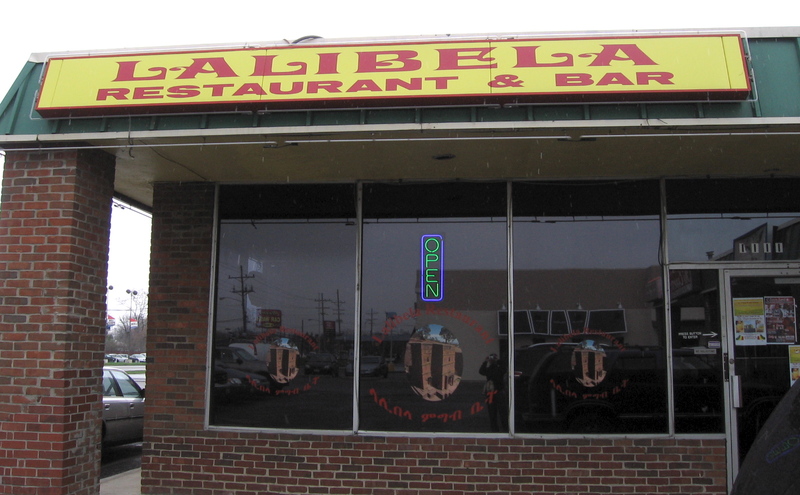 Lalibela is open until 2:30 a.m. and serves a full menu until 1:30 a.m. every night of the week–that’s how they locked up my business at least once per week. The injera there is actually less tangy than some of the other places I’ve had it– you might have just gotten a bad batch. They are still up and running, and still acting as a community center (in the broader sense) addition to the restaurant. Good stuff, great experience.